Like a cherry on top, rooftop pools are often an anticipated attraction in their own right, adorning buildings with ever more fun and leisure. From bars to hotels, sunsets to paddy fields, discover the best rooftop pools in Bali. Located in the hip area of Jimbaran, this stylish rooftop bar on the top of RIMBA Jimbaran Bali offers a lively spot to chill out and enjoy the youthful vibe, tasty meals, and captivating view of the surrounding lush greenery. An important element of this bar is the 25-meter infinity pool, which has become guests’ favorite spot to take a dip. Be it a swim on sunny mornings, chill-out during sunset hours, or vibrant party late at night, the rooftop area presents guests with a one-stop lifestyle destination. 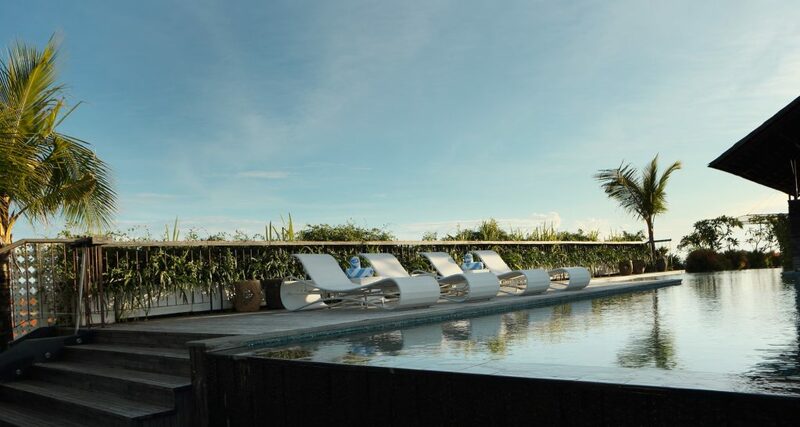 Like an oasis in the middle of the busy Kuta neighborhood, the Heights (or stylistically known as H8S) offers a relaxing ambiance enveloping its translucent rooftop pool. With wooden exterior and plantlife, just the sight of the rooftop area will calm any weary soul. But don’t be satisfied just yet, as a plunge into the fresh water will recharge the body even more, topped with the luscious food and beverage to feast on. Perched on top of the stylish boutique hotel Koa D’Surfer Hotel, visitors can enjoy the same hospitality, inspired architecture design, and overall welcoming atmosphere that the hotel has to offer. 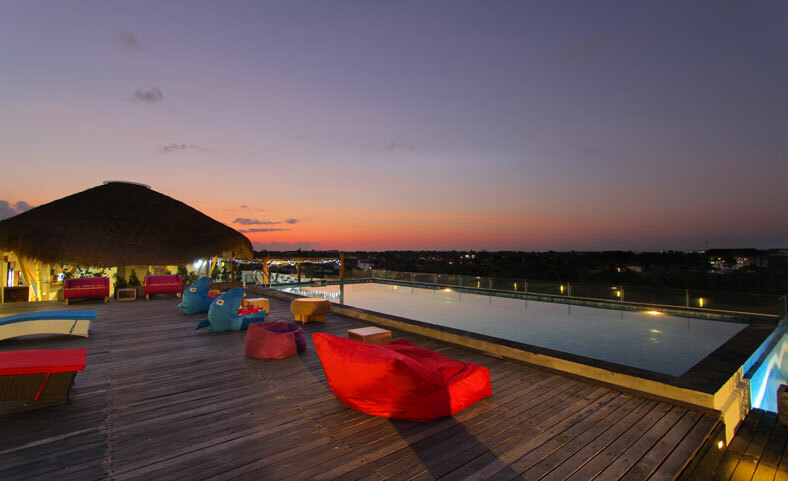 The rooftop bar boasts a magnificent view of surrounding paddy fields, hip surfer town of Canggu, and panoramic sunsets. Visitors can enjoy a wide array of menu options in one of the seating areas: tables by the rooftop shack, lazy chairs, and hammocks in the playful sandy area, or colorful beanbag chairs by the pool. A large, gorgeous pool lies at the center of the U Paasha Hotel’s rooftop area, and revolving around it are stylish day beds, bean bags, and cushions for guests to relax while munching and licking their fingers on the impressive set of menus, from Western to traditional. The place also boasts breath-taking view of the glorious Bali sunsets, framed by the silhouette of its own iconic palm trees and umbrellas. Towering higher than most of its surrounding buildings, this hotel’s rooftop area presents tourists with an unrestricted fascinating view of the Seminyak neighborhood from the top — buildings, houses, palm trees, and the mighty horizon. Either from the large swimming pool or cozy sofas facing west, the sunset experience is as unforgettable as it can be, topped with mouthwatering meals and energizing drinks from the bar. The hotel’s intricate and sophisticated building structure dedicate the best spaces for rooftop pools (yes, plural). From stylish private pools to translucent infinity pool surrounding the romantic pavilion, guests are presented with a selection of impressive swimming options, each with its own feature and characteristic. As a family-friendly hotel, kids and adults can find abundant space to splash and have fun or relax while enjoying Bali’s view from the top. 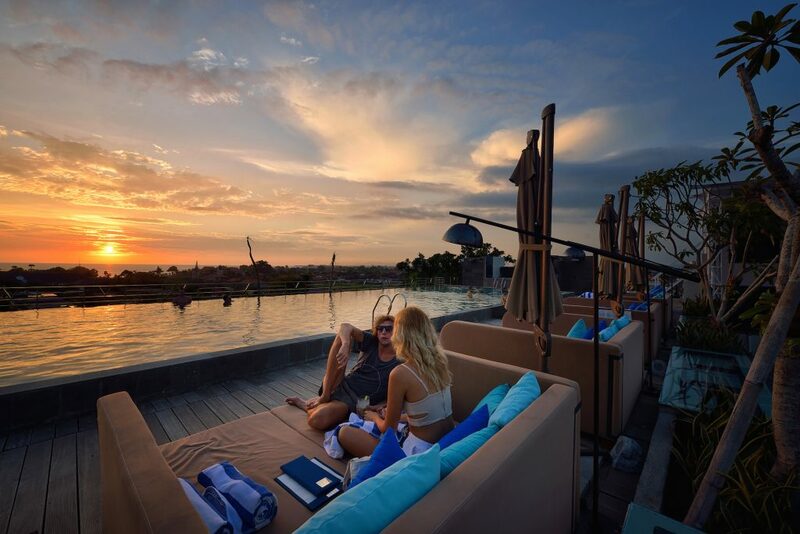 Strategically located just by the coastline of Kuta Beach, this hotel boasts an unparalleled view of the world-famous beach from its property, especially the much-loved rooftop pool and bar. The daybeds by the pool face directly towards the glorious Bali sunset, a magnificent horizon mesmerizing to see any time of the day. The pool itself is suitable for those who fancy a relaxed dip with drink in hand, also for those seeking to exercise and stay fit.